a member of Nitten-KAI, a councilor of NIKKO-KAI, a member of SOKO-KAI, and a board member of Wakayama Artists Association. Framed Urushi art “Blessing from Nature” received the Award of Minister of Education, Culture, Sports, Science and Technology at the 14th annual NIKKO-KAI Exhibition. Recieved the Cultural Merits Award of Wakayama prefecture. Awarded the 8th annual Culture Prize of Kainan city. Screen “Joy of Nature” awarded the Special Prize at the 16th annual Nitten (The Japan Fine Arts Exhibition). Received the Cultural Incentive Award of Wakayama prefecture. First accepted at the 5th annual Nitten (The Japan Fine Arts Exhibition). 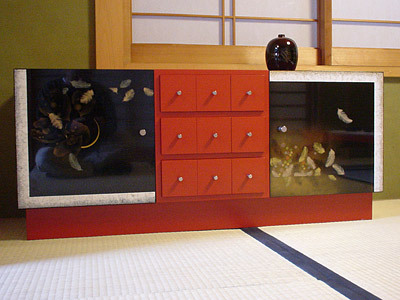 Studied under Urushi artist, Kenji Saji in Tokyo, Japan. Born in Kainan, Wakayama, Japan.